Banking giant Santander has admitted that up to 35,000 people could have received other customers' details on bank statements. A printing error led to pages from other customers' statements appearing on paperwork sent to current account holders. As a result, recipients were sent details of their own transactions and other people's as well. The bank has apologised, but said there was no added risk of fraud as a result. The bank, which has five million current account holders in the UK, said that thousands of people could have been affected by the "technical error" at its printers. The duplication affected current account statements that were dated 18 December and being sent across the UK. Pages two and three of the statements featured another customer's details. 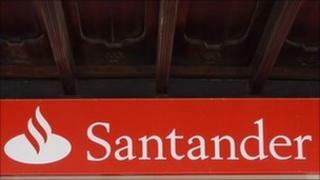 After customers complained about seeing other people's transactions, Santander immediately informed the City watchdog the Financial Services Authority of the problem. "We are sorry for any inconvenience this has caused and have taken immediate steps to correct this," said a spokesman for Santander. "We take the security of customer and account information extremely seriously, so any incident of this nature is treated with the highest priority. The bank said customers' accounts could not be accessed using the information found on the statement. The spokesman said that although one customer could see another customer's name, account number and spending habits, this would not give access to the account. He added that call centre staff had been made aware of the issue. "This is embarrassing and customers have every right to be upset," he added. The printing system resets after 35,000 statements are printed, and this prevented more of the 150,000 statements printing during the day being affected. But some customers who were sent the statements told the BBC they were concerned about the breach of confidence. "Initially I thought the statement was mine because my name, address and account number were correct, but when I turned the page over, I could see that transactions were someone else's. I could also see the other person's name, account number and sort code," said Anne Robb, from Edinburgh. "I called the bank to complain. The staff were very professional and helpful, but I am still concerned that someone has details of what money comes into and goes out of my account." Carrie Cameron, of Wemyss Bay, Inverclyde, said: "I have been an account holder with Santander, and Abbey, in one form or another since I was a child, but I am quite fed up with them. "This is the last straw for me. I am in the process of closing my Santander account and transferring to a different bank." The FSA said it had been informed and was "keeping a close eye on the situation". A spokesman for the Information Commissioner's Office said: "Under the Data Protection Act, organisations that process personal information have an obligation to keep it secure. Therefore, it is a matter of concern if information such as account details have been incorrectly provided to the wrong recipient. "Banks risk losing the confidence and trust of their customers if they fail to safeguard personal information." The case is similar to other mistakes made by banks and the UK tax authority. HM Revenue and Customs apologised in May after the private financial details of up to 50,000 people who claim tax credits were mistakenly sent out in the post. Claimants were sent their annual tax credit award notice, along with personal details of other claimants. One woman from Hyde in Greater Manchester said her letter from HMRC included her neighbour's earnings. She also got the bank sort code and the last four digits of the bank account number of another claimant. In February, Skipton Building Society offered a change of account number to customers whose names, account numbers and balances were printed on the back of other people's statements. And in July 2007, the online banking system of Abbey - now owned by Santander - suffered technical problems, which meant some users were randomly shown details relating to other customers. The FSA has fined a number of financial services businesses in the past for failing to protect customers' personal details.